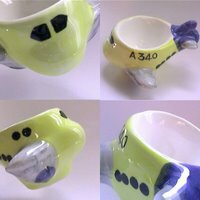 Transportation egg cups are one of the most popular types of figural egg cups, probably due to their appeal to children. They can represent cars, planes, trains, and a lot of different moving engines. 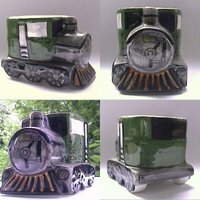 Ceramic transportation egg cups were especially popular in the 80s. 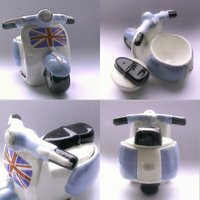 Nowadays there might be less new egg cups of this type on the market, but, still, new models do appear almost constantly. 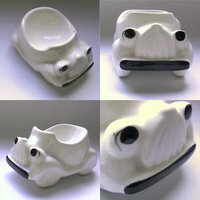 The big difference is that now specialisation and nostalgia seem to be two of the keywords in the field. 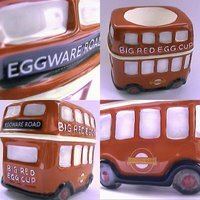 A company -author of the first three of the featured egg cups - is currently directly targetting collectors and nostalgics with its highly-detailed and almost iconic transportation egg cups. 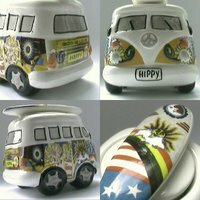 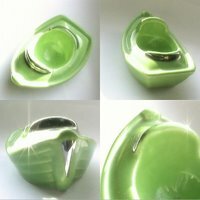 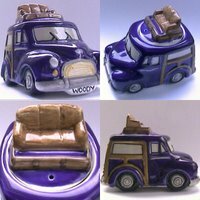 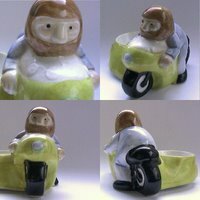 Known details: 1) mod Vespa, including salt cellar [eggcup4595]; 2) hippie Volkswagen van, including salt cellar [eggcup4136]; 3) "Traveller" Morris Minor Estate, including salt cellar [eggcup4026]; 4) produced by Knobler (Japan) [eggcup2582]; 5) Routemaster bus, made by Border Fine Arts (United Kingdom) [eggcup2379]; 6) hand-painted [eggcup2245]; 7) hand-painted [eggcup1177]; 8) made in England, probably by Honiton [eggcup2287]; 9) Airbus A340 [eggcup2203]. 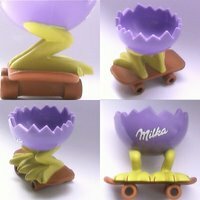 I don't know if somebody would like to consider a transportation egg cup this Milka skateboarding egg cup from the Advertising and merchandsing egg cups selection.